Before discussing the different social aspects, I wanted to give a short overview about the way I tackled this assignment. The assigned research condition was to create a human character, first play a couple of hours solo and then a couple of hours with an assigned group. Reaching level 6 soloing, I considered my character ready for group play. Wanting to explore the world a bit more, and not risking running away with levels, I created an alternate character on another realm. This time I picked a dwarf priest which I also quickly reached level 5. After playing with my assigned group for a couple of hours, I had reached level 8, 2 levels shy of the 10 goal. Unfortunately, a new expansion was released just then and the realm of my main character was regularly completely congested. So I continued playing with my dwarf and eventually reached level 10 and visited both Ironforge and Stormwind City, taking the Deeprun Tram to go in the one direction and a Gryphon to get back. 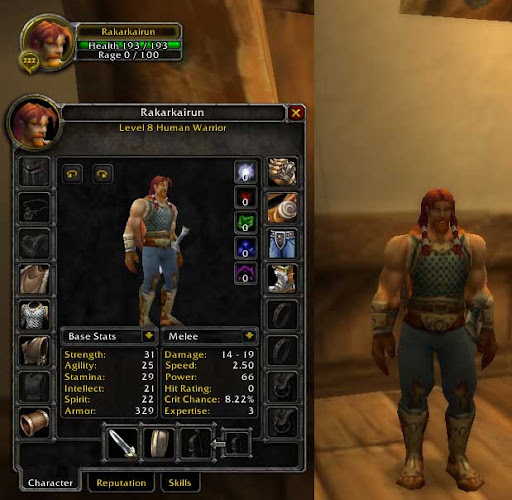 WoW tries to show new players how the game works through displaying context sensitive tips. So the user is not overwhelmed with a flood of information, but successively learns new things as they become relevant to him. This works very well for people who have played similar role-playing games, because they are familiar with the principles behind the game mechanics. So I had no problems finding my way around, picking up the first quest and getting started. However, a complete newbie to these kinds of games might be so distracted by the myriad of controls and things going on, that he might miss these tips. A possible improvement would be an optional meta-game tutorial, which would describe the function of the key elements on the screen (such as health bar, map, and tips) before the user is let loose in the world. Experienced users can choose to abort this if they are already familiar with the concepts. 1) The quests which start out being quite easy to accomplish and then incrementally get more difficult, taking more time and effort to complete as the game goes on. 2) The other players which have reached higher levels and can from time to time be encountered. Such an encountered leads to a wow effect. The newbie sees how cool and powerful his character can become if he only dedicates enough time to it. The first element definitely was a conscious design choice of Blizzard, whereas I’m not so sure about the second element. I’d guess that it is something that just naturally occurred as more players reached higher levels and kept on playing. What can we learn from this? Even though there are advantages to keep newbies separated from the harsh reality of the game until they have got their bearings, a complete separation would eliminate the second point. So it may be a good thing to strike a balance, starting the player in a low threat area, but still giving higher level characters incentives to visit these places from time to time. Playing solo at the start of the game worked well for me; it gave me enough time to get used to the controls and the quests were simple enough, that I didn’t need other people to finish. However, speaking with one of my group members, I realised that this may not be true for players inexperienced with role-playing games. All he did to level up was killing monsters; he wasn’t aware that there were quests which made levelling up more meaningful and easier. As the game progressed and the quests got more difficult, group play became almost mandatory. With my dwarf healer I stood no chance of completing some quests, because I was regularly overwhelmed by the number of enemies around. Fighting with other players helped distribute the aggression of the enemies and dramatically increase our chance of success. So knowing a couple of people with the same level and the same goals works well at this point. But even solo players are not completely at a loss. There being so many other players around and I often was invited into short term parties were trying to complete the same quest. Nevertheless, finding a party can be quite hard for certain quests and requires a fair amount of luck and good timing (at least with the trial account and its limitations). So we can observe two kinds of group play in WoW. First, partnerships of convenience of solo players who happen to be in the same region and have the same goals and second, groups which have a long term goal of playing together and completing several consecutive quests. More often than not this second type of group is organised around a guild. Early in the game the first kind of groups seem to be more important than in the end-game phase, this is mainly because the quests early in the game do not require a lot of coordination and time to solve and even strangers can easily step in and help. In the end-game, however, when quests and raids become long and dangerous, coordination and trust are key, both things which don’t come naturally to partnerships of convenience and so guilds start playing an integral part in the game. Keeping the consequences of failure low is key to keep people from becoming frustrated and quitting the game. WoW’s concept of dying strikes a fair balance between punishment and continuing the game. Whereas it is annoying to walk back to the corpse, achievements a player completed so far are retained and he can continue with his quest. In many solo games the consequences for dying are that you have to start the level / quest from the beginning again. This can become very frustrating, especially when you die close to completing the quest. Nevertheless I had a couple of problems with this mechanism of dying. Exploring the area I ventured into the Gnomeregan mines. There was no one to stop my decent. However, once at the bottom I was promptly killed by monsters far above my level. Walking back to my corpse I saw that the entrance now also was crowded with these powerful monsters, apparently a party marched in just before I ventured inside, and so was promptly killed again trying to flee the dungeon. Having to do this several times can be extremely annoying. So in the spirit of encouraging newcomers to continue playing, I would welcome an emergency exit which becomes available if the dungeon one finds oneself in is drastically overpowered. 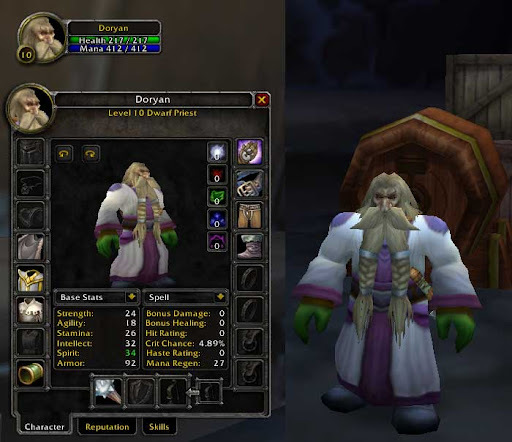 Blizzard did a good job keeping the game fun for newcomers as well as old timers, offering a wide range of activities to pursue which address the interests of the different player types, such as Achiever, Explorer, Socialiser and Killer. And so I can understand how people get addicted to the game. And if the game had come out a couple of years earlier, even I might have started playing it. But at the current moment in time there are too many other interesting things going on, not leaving enough time to play WoW economically (playing enough to warrant the monthly fee).